Laddu or Laddoo is an Indian sweet or dessert that is often prepared to celebrate festivals or household events such as weddings. It is especially made during the Festival of Makar Sankranti, which falls on January 14th every year! Ladoos are always round in shape and mostly range from 1inch to 2 inches in diameter. Some have a soft to bite-into-consistency while others are hard to bite into and almost like jaw breeakers. Ladoos are usually made out of some flour like wheat, besan or gram flour, or nuts like sesame seeds, peanuts as the main ingredient and hot sugar syrup or jaggery syrup. They are formed into balls and let to cool. 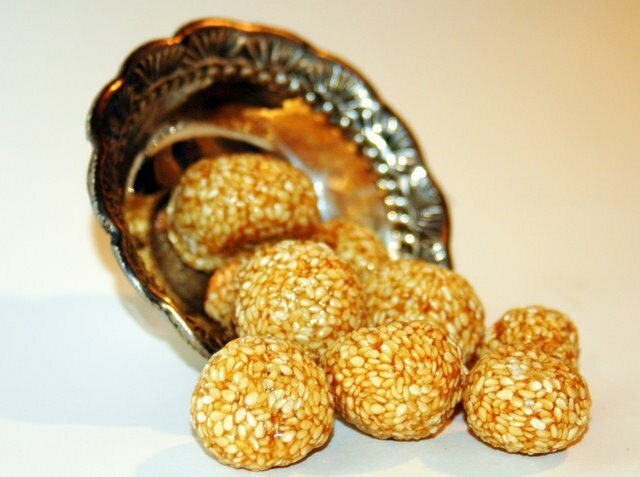 Some examples of ladoo are : Til ladoo, Motichoor ladoo, Boondi Ladoo, Churma Ladoo, Peanut ladoo, Cashewnut ladoo, Rava Ladoo, Atta or Wheat ladoo, Laddoo made from Sesame seeds or Til and jaggery are especially made for the festival of Sankrant. *Note : This jaggery is specially called "Chikki cha gul". It is meant for making ladoos and is less brittle when cooked. You can use the regular jaggery if it not available in your local Indian grocery store. Roast the sesame seeds and peanuts separately. Keep aside for cooling. After the peanuts are cold, skin it and crush them in a mortar and pestle, into big pieces. Heat the ghee in a vessel, when hot add the jaggery. The jaggery will liquefy and start to foam and froth. Remove the vessel from heat source and add the sesame seeds, crushed peanuts, roasted channa daal and cardamom powder. Mix well and keep stirring. Using a little ghee to coat your hands take a piece of the warm mixture and form very small balls/ladoos, 1 inch in diameter. Store in a container. Will stay for a long time.